Brighten and freshen every room of the home with our original, sought-after fragrance captured in the purest essential oil room spray. This signature scent features uplifting citrus and stimulating bergamot with soft, woody undertones, perfectly blended by our expert Perfumer. 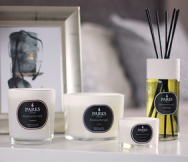 The Parks Original fragrance is a favourite among our customers and is also one of the most popular choices for those new to the luxury Parks brand. The citrus notes are invigorating, ideal for energising your day—while the fragrant bergamot is a powerful relaxant that can help to reduce stress. Bergamot is also known for its ability to relieve sadness and create a feeling of freshness, energy, and joy—the perfect backdrop for a happy home. Our Parks Original Room Spray is the natural choice for a sophisticated lingering fragrance in every room. While many mainstream ‘air freshener’ products contain dangerous cocktails of chemicals and allergens known to cause significant health problems, we use only the purest essential oils in our room sprays—so you can be confident that they will protect and benefit your family’s health. Our oils are carefully sourced and selected from specialist producers around the world due to their exceptional quality. With just a small amount needed to beautifully scent your living space, this 100ml spray offers long-lasting great value. Our signature scent comes in a sleek branded bottle packaged in one of our iconic black and white gift cartons. Simple black trims and our stylish branding makes this the perfect gift for a truly discerning recipient who appreciates fine fragrances.